Wow, what a weekend it was last weekend for the runners of ARC. Firstly some members took place in local parkruns where the following achieved course PB’s: John Surtees at Albert Park in 17.15, Paul Dalton at Gateshead in 19.41 and Richard Holland at Shildon in 21.33. The same day a bus full of runners descended on the small village of Dent in the Yorkshire Dales to take part in their annual race. There were two distances covered by the runners, the shorter one of 7.9 miles and the longer 14.2 mile race. On arrival it was raining quite heavily but fortunately the rain held off for most of the tough race which whilst extremely scenic is certainly Hilly. It must be mentioned that three of the female runners (Trish Kay, Michelle Zamir and Angela Sutheran) took the First Prize for the Female Team. Well done ladies. Results were as follows: – For the 7.9 miles race, Trish Kay 65.57, Michelle Zamir 66.07, Angela Sutheron 70.08m, Alan Kellet 73.57, Anne Kellet 75.27, Kathleen Tonge 83.23, Donna Campbell 87.02 and Susan Clark 88.48. Sunday then saw runners participating in two different sets of races. Some runners took part in the Cross Country Relays at South Park, Darlington including some of the people who had run in the Dentdale race the day before. Each runner completed two laps equalling two miles and some really good times were recorded. We had two teams in the mens and womens races and one of the mens teams came fourth. Thank you to Richard Campbell, Richard Holland, Trevor Needham, Dez Fielden, Ian Baronowski, Ray Todd, Richard Tonge, Rob Nicholson, Angela Sutheran, Jane Burnside, Kathleen Tonge, Lindsey Brown and Heather Fenwick for putting yourselves forward. These races concluded with a presentation of awards from the Cross Country Season and we had three members receive awards. 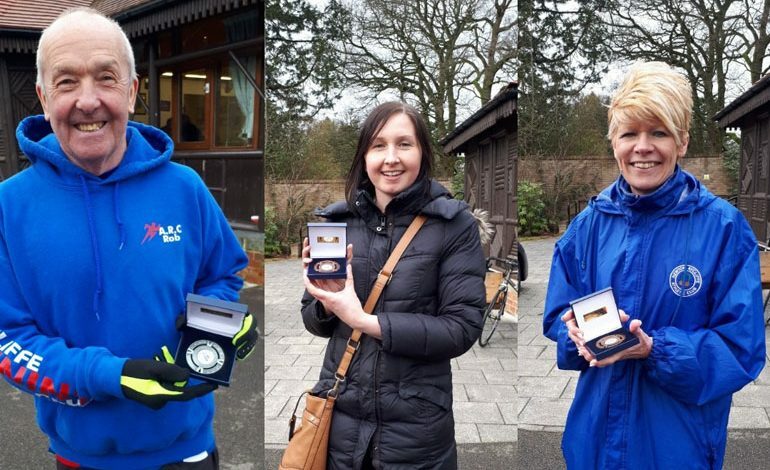 Michelle Jane was third in the serious women category, Rob Nicholson was second in over 60’s men and Jane Burnside was third in over 60’s women. Well done all. Finally Eve Doe joined two of our new members, Carol Anne Stanger and Jan M<cLuckie at the Resolution 10k at Tees Barrage to raise money for Stroke Association. This was Carol and Jan’s first 10k race. Although it was not strictly timed Eve ran the route in approximately 1 hour 12 with Carol and Jan following in approximately 1 hour 21. Well done ladies.